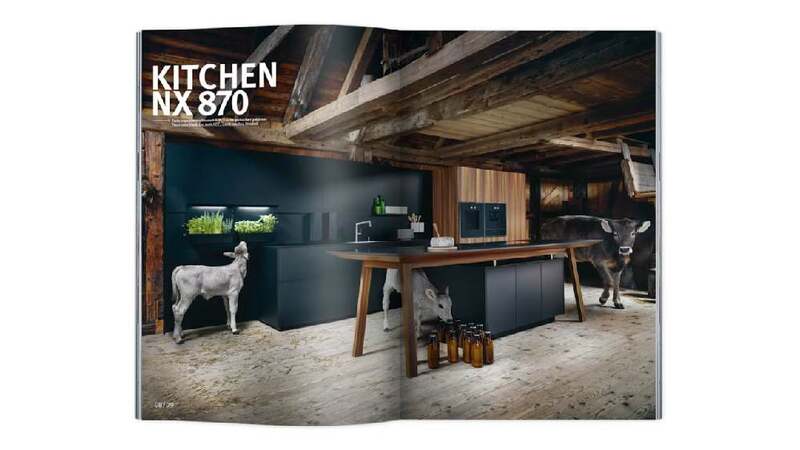 Internationality with a regional farmyard twist – this is the humorous main topic of the new next125 magazine for the Eurocucina kitchen trade show in Milan. The opener goes to Bavaria’s Allgäu region, presenting organic dairy farmer Peter who stands with cows in front of a premium kitchen in his house from 1550. Outstanding photographs emphasise the contrast between the old and new of the various high-quality materials, as well as between the rustic and the highly modern style of the kitchen hob, catching the eye with an appealing unusual setting. The theme of internationality leads to a showroom in Dubai, showcasing a kitchen of this brand in the Burj Khalifa, and then proceeds to the Chinese megacity of Shenzhen. Opening up new perspectives, the featured stories and interviews with interesting, creative personalities are also typographically visualised in a manner that helps keep sus-pense high. With its fluorescent-coloured pop art style print cover and untrimmed pages, which are held together only by a rubber band, the Big Magazine manages to attract a lot of attention. The truly big next125 Big Magazine 2018 fascinates with a striking design marked by impressive photo spreads and a clear, versatile typeface. The way it manages to communicate the contents in a tasteful manner is particularly outstanding, raising awareness of what is behind and in a kitchen. It merges design and storytelling in a highly skilful and contemporary approach.